BY A resounding vote of 8, the Sangguniang Panlalawigan of Ilocos Norte in their regular session on June 27 declared Rudy Fariñas as persona non grata. The congressman was expectedly piqued, but he was right to point out in his statement that referring to someone as persona non grata is to say that “he or she is ostracized, and that such a person is for all intents and purposes culturally shunned, so as to be figuratively non-existent.” That exactly is what board members have done to him. The term “persona non grata” is Latin for “a person not appreciated.” It was originally meant for diplomats and foreigners who have been deemed undesirable or unwelcome, but it is not the first time a Filipino citizen has been declared non grata in his own country. Ramon Bautista was declared persona non grata by the Davao City Council for his hipon jokes in a party in the city during the celebration of Kadayawan Festival in 2014. Bautista joked that many women in the city are “hipon” which is a derogatory term for a person with a sexually appealing body but with a less attractive face. Last year, the Sagguniang Panlalawigan of Pangasinan also declared Dr. Dexter Buted, president of the Pangasinan State University (PSU) as persona non grata after he snubbed the board’s three invitations to him and other university officials to appear before an inquiry. Herdy, Laoag’s missing funds were the accountability of Elena Asuncion, and she is presumed to have misappropriated them. The loss of the huge amount of money is of public knowledge and the COA, NBI and Ombudsman are investigating it. On the other hand, the case of the misuse of the funds from the excise tax on tobacco, was granted by law to the beneficiary for specific purpose. It is incumbent upon Congress to review the law, aside from the fact that the acquisition of the 115 motor vehicles was overpriced and made through cash advances without public bidding. Worse, all the documents relating to the transaction could no longer be located. If I did not initiate the investigation, would we have known about such? Do you believe that the 6 provincial officials detained, especially those who requested, received and/or approved the cash advances amounting to P66.45M could not remember such transactions? And if, as claimed by Gov. Marcos, that the transactions were above board, they could easily prove that and show that the documents we have are spurious. Indeed, Elena Asuncion is solely responsible for Laoag’s missing funds, and her bosses don’t bear any accountability, if not direct participation, for the plunder. And the earth is the center of the Solar system. Maria Ozawa is a virgin. Elvis Presley is still alive. The Philippines remains a colony of Spain. Ilocos Norte Electric Cooperative is not corrupt. Hannah’s Beach resort did not ruin Pagudpud’s environment. And Leni Robredo did not cheat in the vice presidential race. RUDY Fariñas is no doubt a brilliant lawyer and a skillful politician. He can amaze you with his analytical mind perfectly matched with his gift of gab. He can dazzle you with the wit and humor that go well with his good looks. This congressman, who loves to remind people that he is an Ateneo graduate and a bar topnotcher, can indeed make so-so lawyers look like total idiots. I once wrote after his successful comeback to the national consciousness through the Corona impeachment trial that he should run for the Senate and that it will be a great disservice to the nation and a great injustice to his gifts if he doesn’t. And in another article after his glorious resurrection from political death, I sang my hallelujahs for the triumph of the human spirit. “You have seen the worst in me, now is time to see the best of me,” he said. And most of us believed him. In 2010, he ran with Imee Marcos under the slate of One Ilocos Norte. Imee won as Governor. Rudy was elected congressman of the province’s First District. Such political union was short lived and in 2013, it was One Ilocos Norte no more. But the rift between Rudy and Imee climaxed in recent weeks with the congressional investigations on the supposed misuse of R.A. 7171 funds. The House Committee on Good Government and Public Accountability Committee, of which Rudy is part, alleged that some P66 million in funds intended for the welfare of tobacco framers were wrongfully used for the purchase of vehicles, and that there were obvious irregularities in procurement procedures. I will leave the facts and legalities to the experts, for I am neither a lawyer nor an accountant. But let me give my two cents on who is winning in this political battle. Last month, nag-usap-usap kami ng aking staff saan kami mag-inaugurate o mag-launch ng aming presidential at vice-presidential. Some suggested the North, some the South because I come from the Visayas, some wanted the rally or whatever event might happen inside Metro Manila, some outside Metro Manila. Pero bandang huli, dahil marami na masyado ang nagsasalita, ka’ko, dalhin niyo ako sa campus where I have always been most comfortable with an audience, but only a campus consisting of ordinary students. I want a campus with a high IQ. After the merriment that was the Parada Iloca-locana Halloween Parade on Oct. 31, some participants went to Uncle’s Bar in Brgy. 23, Laoag City. It had been a long and tiring week which they decided to cap with some cold drinks in the warm company of friends. But the night ended in tragedy for Wayner Tulali and Lucky Gappi, both from Batac. In a rumble that ensued a few meters from the bar, they were stabbed multiple times, each of them, as their group was about to go home at past 4:00 a.m. Another man from the opposing group was reportedly hurt. A criminal case has been filed against one suspect (who was also hurt in the incident), and the victims’ friends say for now they are trusting in the process, though fears of a whitewash can’t be avoided as one of those who they allege was part of the mayhem is a son of an influential politician. Indeed, dear karikna, that’s too much a lack of empathy, not to mention responsibility, for a business establishment, especially for one whose name refers to a close relative. One wishes that their concern for clients in distress is as warm as an uncle’s hug, and not as cold as their beer. Going to Sarrat is usually fun and relaxing. We’ve had countless family picnics in the town’s charming river resorts, visits to President Marcos’ birthplace, or just strolls around the sleepy town. Each journey is memorable, but it’s the one we made on August 4, Tuesday, I will never forget. That trip was the saddest I have taken in my whole life. Seated on my passenger seat was fellow writer and office mate, Reynaldo Andres. We were headed to the morgue to see the body of a slay victim Sir Rey would later confirm is his only child. That morning in our office, Sir Rey looked worried and upset. He received a text message from his daughter Mai-mai, saying that she is in Cebu and that she needs money for her return fare. Sir Rey was surprised, for she thought his only child, a graduating student, was just working on a group project as she occasionally does with trusted classmates she has treated as sisters. 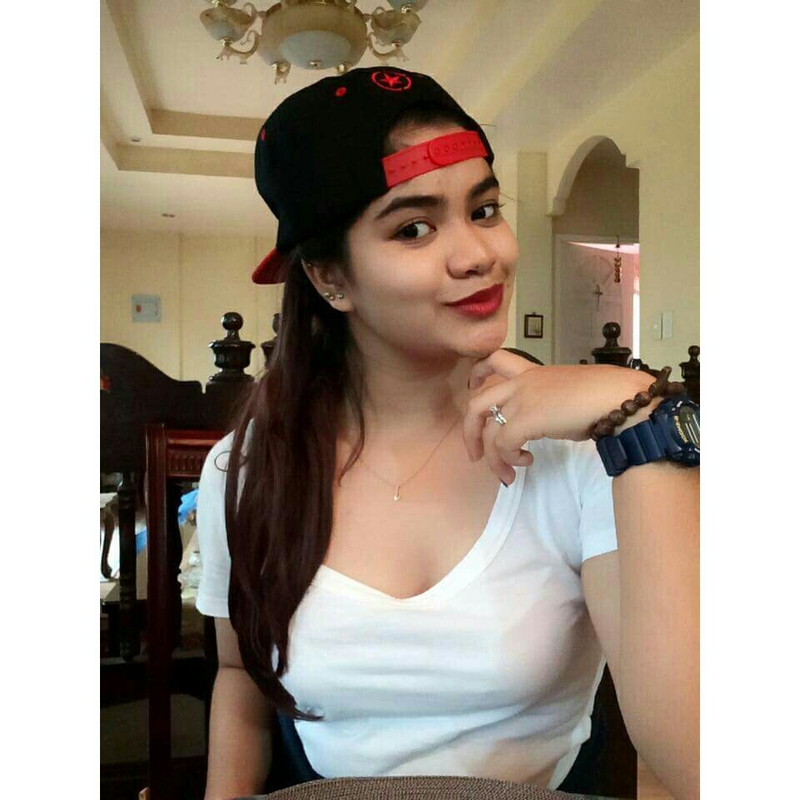 The text message said money should be sent to a certain “Francis Domingo Ortega” with an address in La Union because her daughter’s identification card is not with her. She said they were in the Waterfront Hotel. Sir Rey immediately went out of the office to send his daughter P15,000 through a money transfer outlet in Batac. That was around 9:00 a.m. I, too, went out of the office to attend my classes. When I returned for lunch at past twelve, Sir Rey was doubly emotional and nervous. When he called his daughter to say that the money has been deposited, the phone can no longer be reached. Then came a phone call from another office in our university. The caller informed Sir Rey that she saw a Facebook post referring to her daughter: RIP. Sir Rey immediately went out of the door. After a few seconds trying to absorb the turn of events, I and our colleagues in the office–Ma’am Kat and Sharon–joined him. And thus our trip to Sarrat where radio reports say a body of a woman, with a bullet wound on her head, was found at dawn. As it turned out, many already knew about the identity of the victim a couple of hours before Sir Rey was informed. Her classmates who earlier identified Mai-mai at the morgue did not know how to tell Sir Rey, but they immediately gave their statement to the police. The travel took at least forty-five minutes. I could have sped up so we can get there soonest, but I was extra careful as my knees were wobbly and I was feeling cold all over. Sir Rey, the tough guy and brilliant Ilocano writer Bannawag and Agriculture Magazine readers are very familiar with, was on my side weeping… weeping for her daughter and also for himself. “She is the joy and hope of my life,” he said as he shared stories about Mai-mai: how the English language major was very good at writing poems and how proud she was about inheriting her father’s writing skills, how she dreamt of going to Law School, how her charming and jolly personality brought cheer to friends and family, and how happy she was turning nineteen just a few days ago. Mai-mai was my student in Logic when she was a sophomore. Hands down the most stunning in class, she was also the most convivial. As her friends attest, she can brighten up a dark day with her ready smile and jolly disposition. But I only discovered only a year after that semester, that she is the daughter of Sir Rey, an institution in Ilocano literature and one of the country’s top science writers. The free-spirited Mai-mai was proud of her father but she wanted to establish her own name. Sir Rey’s stories kept us all teary eyed. I would have cried with him, but all of us had to show some semblance of strength and hope. Maybe it was not Mai-mai. May be it was a mistaken identity. But then calls came one after the other. Some offered very clear clues. On the victim’s tattoo was the word “Jem” and Roman numerals that translate to July 28, 1996. Is that her nickname? Is that her birthday? “Yes,” said Sir Rey who was losing whatever hope he still held on to. “Nagulpiten ti tao..”, he said sobbing, wailing, and without propagating gender stereotypes, I say it struck me so hard to see a typical macho like Sir Rey weep unrestrained. He cried for justice even as the suspect was initially believed to be related to a powerful political clan. Indeed, the trip to Sarrat was a crash course for me on the society we live in today: the value of family (Sir Rey narrated both the joys and hardships of fatherhood), the power and responsibility of the media and the Internet (and how Sir Rey, also a media practitioner, was among the last to know), the weight we give to education (Mai-mai was determined to graduate in April next year), our strong faith in God (“Dios ti makaammon,” said Sir Rey as he immediately called their church pastor who also immediately proceeded to the funeral home), and the impacts of politico-economic imbalances (that feeling of powerlessness when the suspect is believed to be influential). When we arrived in Sarrat, we decided to go to the police first before proceeding to the funeral home. At the morgue, Sir Rey confirmed what we hoped was just a confusion, a bad dream, or just a distasteful joke. 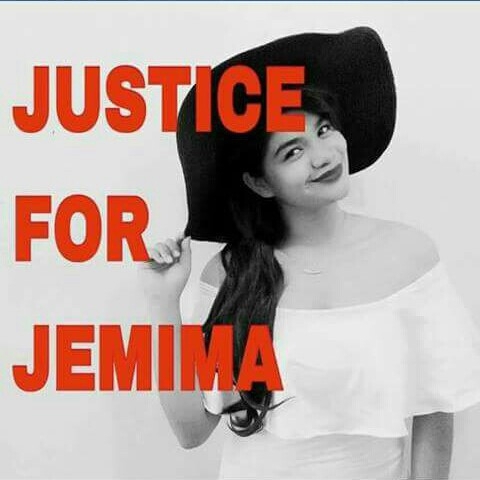 Jemima Keziah Andres, our beloved Mai-mai, is dead. What we know about the culprit so far. The suspect, who is in his mid-20s, was initially named as “Francis Domingo Ortega” and was believed to be from La Union province and a relative of the provincial governor, but the name turned out to be an alias. Said to be charged with estafa and in running, he created a false persona for himself, creating a fake Facebook account. When the suspect’s picture was widely circulated in social media, concerned Netizens revealed his true persona. 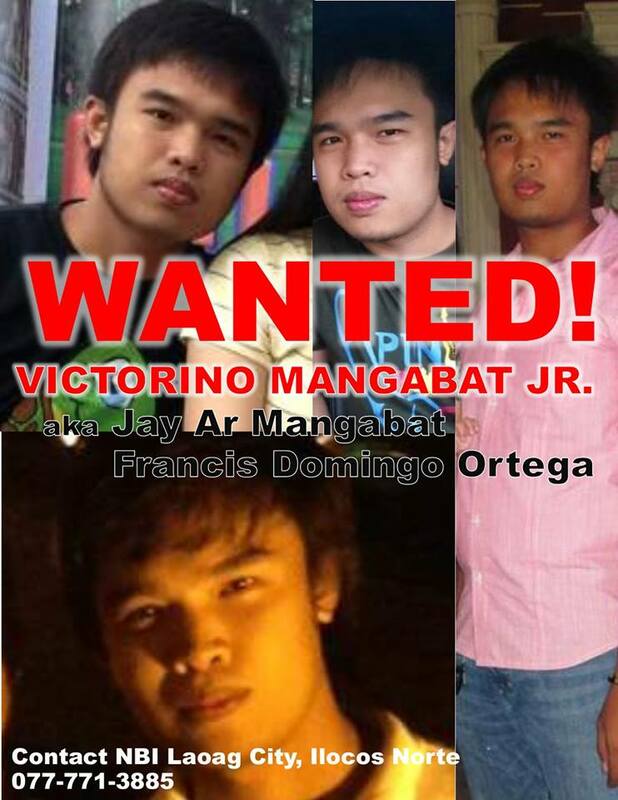 Victorino “Jay Ar” Mangabat Jr is his real name. Originally from Cauayan, Isabela, he has also lived in Gapan, Nueva Ecija. He has three Facebook accounts by the name Jay Ar Mangabat. One account indicated that he studied at the Ateneo de Manila University while two other accounts listed his schools as University of Sto. Tomas and Our Lady of the Pillar College, Cauayan City, respectively. He is engaged and has a three-year old son. Mysteriously, his fiancé is said to have been missing for around a year now under mysterious circumstances. The suspect, together with his son and mother, rented an apartment in Barangay Aglipay, Batac City on July 3. They hurriedly left the place at around 3:30 a.m. on August 4. A source said they stayed in a lodging house in Laoag City for three days in June. He is driving a white Montero with a fictitious plate number. Those who have met the suspect describe him as the silent type, haggard, had unkempt hair, and “lutang”, a term specifically used for drug users. He pretended to be rich, but it was not clear what work he did. If you have any information leading to his arrest, please contact the authorities immediately. The NBI Laoag Hotline is (077) 771-3885. May we, my dear friends, altogether pray for the eternal repose of Jemima, fight for justice, and work for a society where no person, man or woman, will have have to suffer the same fate, and that no father will have to take the same sorrowful trip to Sarrat or elsewhere. We, the people of Laoag, will celebrate our golden anniversary as a city tomorrow, June 19, and I am glad that the scheduled activities are modest. I hope the event will be meaningful, and for good reason. Indeed, there are a lot of reasons to be grateful and to celebrate. Laoag today stands as one of the finest cities in the country, having reaped various distinctions including those on, but not limited to, the environment, peace and order, governance, literacy, and the arts. All these were achieved not due to one person or two, but on account of our collective good work as a people. Almost all who see the posters are puzzled. What research? And who is thanking him? Let me give a background. 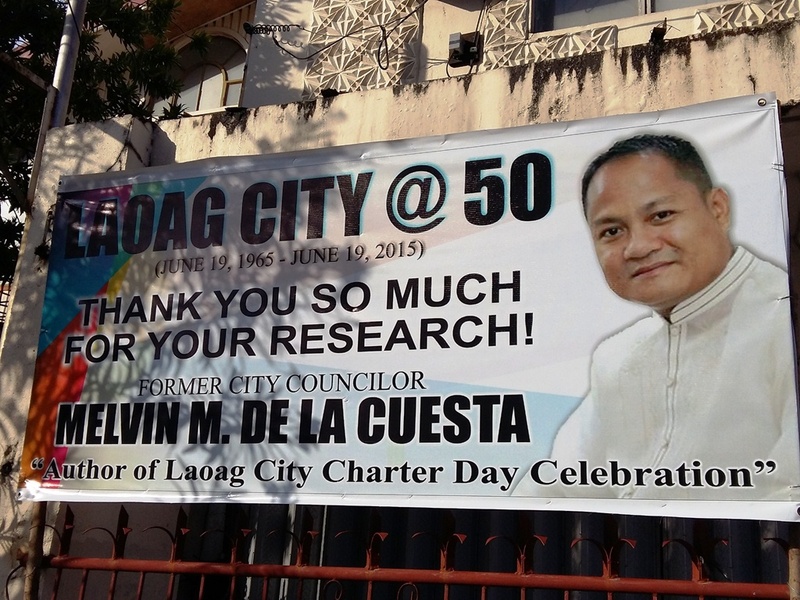 De la Cuesta authored the city ordinance mandating the anniversary celebration of Laoag City’s charter (RA 4584) signed on June 19, 1965 by President Diosdado Macapagal. The ordinance was the subject of controversy as other councilors, including Atty. Toto Lazo, insisted that Laoag’s cityhood must instead be celebrated on January 1 because RA 4584 clearly stipulated January 1, 1966 as effectivity date after its approval by the people through a plebiscite. The research being referred to here is De la Cuesta’s very simple effort of going to the National Library, and maybe the Senate archives, to find details about Laoag’s Charter. In the advent of the Internet, that is something even grade school pupils can do. Only real “researchers,” especially those who immensely contribute to society– for instance, scientists who successfully discover cure for cancer or HIV/AIDS, develop a machine producing free and sufficient electricity, or invent an equipment swiftly detecting and exterminating epal politicians–deserve such grand show of gratitude. But, who is thanking him? 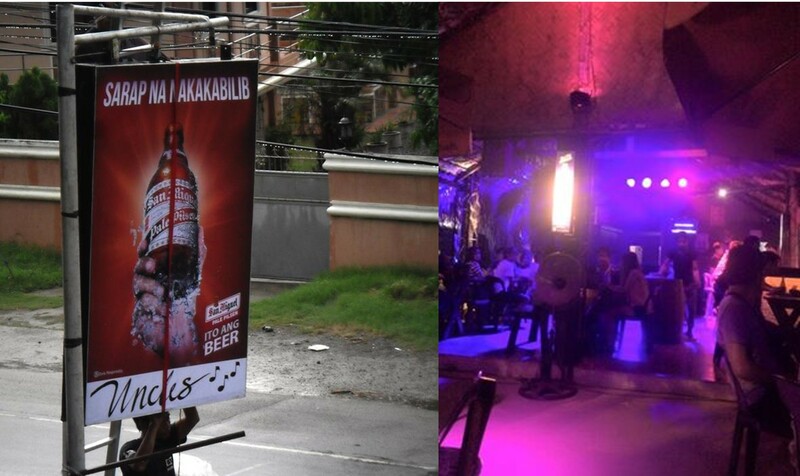 It is very obvious that the tarpaulin posters are self-advertisements. It is De la Cuesta thanking himself. The city government could not have propagated those tarpaulins because, according to well-placed sources, the top city officials ordered the removal of those posters in the downtown. Those hung in the barangays are still abound. At least four of the incumbent city councillors are barred by term limits to run again next year, probably a golden opportunity seen by De la Cuesta—who, after ruining his credibility due to the Jimmy Chua case, has perennially lost in elections in Laoag and Sarrat. De la Cuesta made confusing testimonies on the death of Chua before implicating, and later clearing, then mayor, now vice mayor, Michael V. Fariñas. On account of the fickle-minded whistleblower’s recanting, the case was since dismissed by the Department of Justice due to lack of probable cause. If there is anyone we should be thankful to hence, it is our beloved city Laoag who has nurtured us in the past 50 years and more–not some flip-flopping, self-aggrandizing politician. But if indeed we are in the mood to thank individuals, how can we forget Congressman Simeon Valdez, who sponsored the bill for Laoag’s cityhood? And how about Eulalio Siazon, our city’s first mayor, who earnestly campaigned for a yes vote in the plebiscite? Today, there are no tarpaulin posters in their honor, but they deserve to be remembered by a grateful people.